Only in America can you find a luxury version of a vehicle whose initial purpose for existing was to transport military personnel behind the front lines. At first glance, the green and tan colors of the Humvee do plenty to give the vehicle a less-than-pretty look – but still despite that fact, somebody found a way to pretty up this military grade transport and turn it into a vessel for soccer moms. After Arnold Schwarzenegger turned the Humvee into a civilian vehicle, the fad caught on quick. As if the transformation from military to civilian wasn't bizarre enough, somebody thought even further outside the box to create the classy Hummer limousine. Though the Hummer limo and the Humvee share little in common in terms of style, their purpose remains practically the same – transport a troupe of "soldiers" to an event they'll never forget. The luxurious look of a Hummer limo is enough to make anybody to step on board feel like a celebutante. A sleek exterior does little justice to the expertly designed interior of the vehicle. Running the length of the ceiling is a mishmosh of fiber optic and neon lighting that offer a light glow throughout the vehicle, creating something between a club and lounge atmosphere. Accentuated by a string of fiber optic lights is an on-board mini-bar. Typically stocked with vodka scotch, brandy, champagne, and a mix of soft drinks and water, the mini-bar offers the perfect start to the night's party. The stretch Hummer limo is essentially a club on wheels, sans the dance floor. To create a more personalized experience, a built-in surround sound system comes attached to a CD/DVD player and iPod/MP3 player jack. When the music starts pumping, passengers can take control of the inside lighting through the use of a multi-purpose touch panel. Each panel also simplistically controls heating and A/C, giving passengers complete control of their traveling environment. If privacy is desired, the control panel also has the ability to raise the divider between the front and back of the vehicle. The stretch Hummer limousine couldn't be a more perfect vessel for a bachelor and bachelorette party. Sizing alone can allow for a group of up to eighteen individual guests and plush seating creates an environment suited for any guest of honor. Driving to any event in a stretch Hummer limousine is bound to make any and all passengers feel and look like royalty. Passer-by's are sure to stop and stare in envy at the passing stylish convoy. The next time a party calls for some form of organized transportation, don't waste money on less-than desirable cab rides across town or overpriced monorail tickets. Let the group ride in style and take in the city's attractions through the tinted windows of a luxurious stretch Hummer limousine. 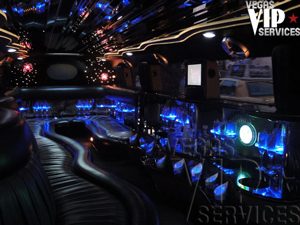 You can book your stretch Hummer limo luxury ride through Vegas VIP Services today.